The July 2010 Mussel of the Month is Coelatura lobensis. Coelatura is a diverse genus of 22 species widely distributed in Africa from the Nile Delta south to the Zambezi and a little beyond. MCZ 21164. Lobo River, Cameroon; ex. G. Schwab (Holotype). 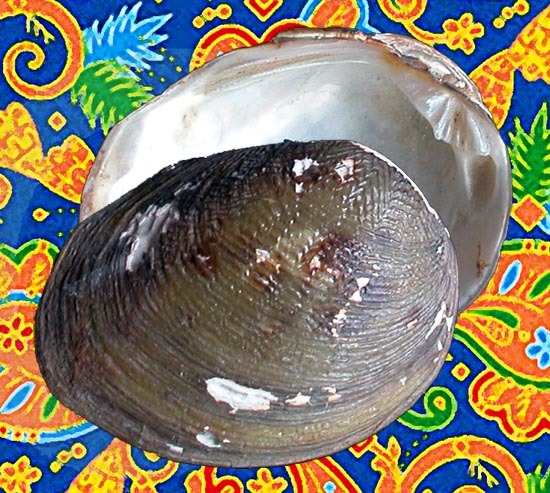 Back in 2005 when Coelatura aegyptiaca was Mussel of the Month, we discussed the "garbage pail" nature of the genus. In the intervening five years, the taxonomic clarity of Coelatura has improved a little. It is still a likely-polyphyletic "garbage pail" but we have managed to pull some species out of synonymy (Graf & Cummings, 2006) and sink some others (Graf & Cummings, 2009). So: there has been some progress, but there is still a ways to go, and as revisionary work proceeds, it is likely that additional modern genera will be recognized. For example, some authors consider C. lobensis to be the sole representative of the genus Afroparreysia. Coelatura lobensis is worth dedicating a month to for two reasons: 1) its current conservation status puts it in jeopardy and 2) if it is still extant, it may be the terminus of a long-lived lineage. C. lobensis is known from only two rivers in Cameroon. Because the known range of this mussel is so restricted and because of potential habitat destruction due to logging, C. lobensis is currently being considered for threatened status on the IUCN Red List. However, this species is known from only 6 museum lots obtained during the first years of the 20th century, and there is really no data to refute the hypothesis that this animal is extinct. However, freshwater mussels with shell morphologies similar to Coelatura lobensis are known from the fossil record of Africa. The family Unionidae is well-represented in rift-lake deposits going as far back as the Miocene. 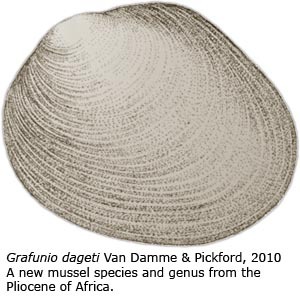 For example, Van Damme & Pickford (2010) recently described a new genus and species from the Pliocene of Lake Albert, Grafunio dageti. Graf, D.L. & K.S. Cummings. 2006. Freshwater mussels (Mollusca: Bivalvia: Unionoida) of Angola, with description of a new species, Mutela wistarmorrisi. Proceedings of the Academy of Natural Sciences of Philadelphia 155: 163-194.